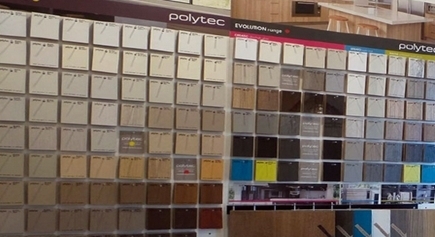 Laminate Benchtops can be finished in a variety of Edge Profiles. 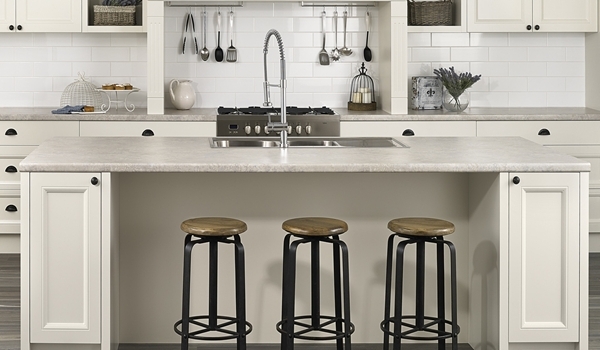 The range of for Kitchen Benchtop Laminates available today provide a huge selection of vibrant Colours, stunning Patterns, realistic Woodgrains and Stone as well as flash Metallic finishes. For a long time now, High Pressure Laminate HPL sheet for Benchtop surfaces has been a well proven to be a Hygienic and Moisture Resistant material that is reasonably heat resistant, reasonably hard wearing, decorative and affordable. The Crystal and Textured surface finishes of laminate are more durable than the Satin finishes while all finishes are reasonably easy to clean. Gloss Laminate finishes are also available, which as a general rule are best kept to the low wear areas of the home; in areas like the bathroom. There is however a “Diamond Gloss” Laminate range available which has been developed for Kitchen Benchtops in a limited range of colours, which is slightly more resistant to abrasion, but can still be scratched and scuffed. There is a design trend with today's Benchtops that has come back to square edges, where you will get a visible joint line. Laminate Benchtops can also be finished with roll-formed (Post-Formed) edges that can be done in a variety of profiles. Depending on the brand of Laminate; these profiles may includes a very tight top and bottom 3mm radius, or a Tight Form 5mm Radius. 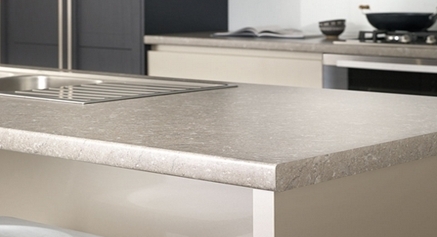 These can also be formed with 10mm or larger radius’ including Full Bullnose Edges if you prefer. 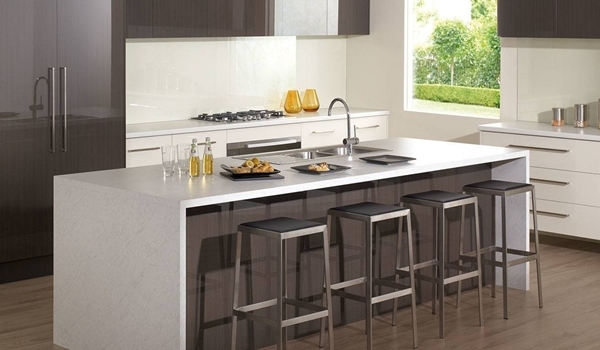 Laminate Benchtops as a general rule are laid up on a 32mm thick board and for a thicker squarer look there is also now a 39mm thick sheet substrate available for Benchtops. 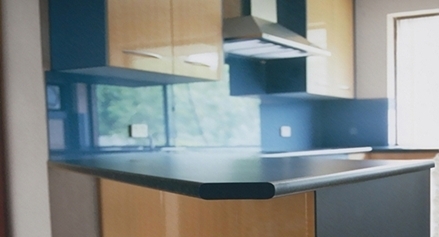 In addition to these, we are also able to make your Benchtops up to any custom thickness you may require. We only use Moisture Resistant board for our Laminate Benchtops and for added moisture protection we use a board that has a Melamine coating to the underside of the top as well. 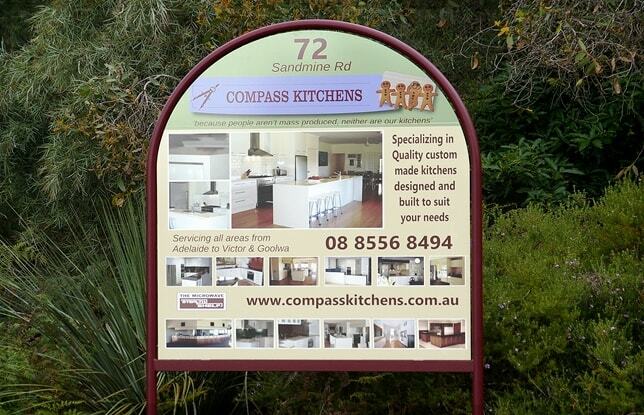 At Compass Kitchens we source laminate from only the best manufacturers to provide you with Benchtops that offer a long service life. You can see links to our various suppliers’ and their Colour Ranges at the bottom of our Materials Page. Most HPL Laminate Manufacturers provide a 7 year Warranty for their products and as a general rule, we find that with general use one should reasonably expect at least 10 years service from High-Pressure Laminate Benchtop before they start to wear through the clear thin protective Melamine Resin overlay that covers the photographic image. By wiping down your Laminate Benchtops and avoiding water being left to pool around the sink, kettle and cooktop; this will help prevent any water damage and further prolong the lifespan of this type of Benchtop material. When selecting a Décor Laminate; Plain Dark Colours can tend to show up scratches and scuffs because these turn the affected Melamine white. If you want a dark top, you may try avoiding a plain solid colour and instead try using one of the dark stone patterns from the wide variety available where these are less likely to show up any scratches that can occur over time. Be mindful of the pattern you choose, some modern patterns can date quite quickly; whereas natural themes have a more timely appeal.